"This is an opportunity to meet many partners, distributors or manufacturers, thus the whole universe of the garden, in 3 days. " "I feel that it is becoming, in any case over the last 3 years, increasingly big and important. There are more and more interesting providers. I look forward to attend the tradeshow again next year. " Build up your upcoming season with a good mix of brands organized by segment, showcased by 350 fully available suppliers. Sign up listings and re-orders: product demonstrations allow them to discover everything in real-life context. Discover market trends made available by the Trends Area organized by Chlorosphere and the Garden Collection Awards’ program. Save time by accessing a comprehensive overview of all offers in your category and being able to test the whole product ranges on site through live demos. 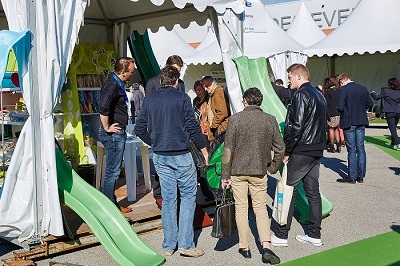 The professional and pleasant mix of a relaxed and fun event with your peers of the garden sector of France and beyond. This event naturally offers a different relationship between buyers and suppliers, conducive to spontaneous exchanges ... taking the time of chat and exchange views, news and ideas. Indoor and outdoor solutions, a new asset to reduce the dependency from weather hazards. Time saved on meeting 350 suppliers. Optimum efficiency: two and a half days, twenty targeted appointments guaranteed! Easy identification of new products on site, including live demos allowing easier tests and sourcing. It’s in Marseille, everything is taken care of*, no need to hesitate. Travelling with colleagues is always interesting. Meeting rooms are provided for retailers: benefit from this opportunity if you come in a delegation! The fair ends on a Thursday… a great opportunity to stay over for an extra day (or weekend) to tour Marseille and visit the MUCEM. * Your travel and accommodation costs* (*under conditions, travel, hotel room, dinner…) are paid for by the organizer, specific conditions apply.